When I embark on a #BikeTrain adventure, I typically put my train-boarding theory to work by heading for the front car. I believe that this car is underutilized by train passengers, most of whom gather in the middle of the platform resulting in the middle cars filling first. I pick the front car over the back car because it’s easier to anticipate the position of the front of the train while the variable length makes the rear car an unpredictable target. This past weekend, Enci and I took our bikes to LA’s Union Station to ride the Metrolink, not so much because of the new Bike Cars, but because of the $10 Weekend Passes. These passes allow passengers to ride from Friday evening to Sunday evening, anywhere on the system, for $10. We rolled through the station, an experience that is always a bit awe-inspiring, and headed to the platform to wait for our train. We took position on the platform so that we were lined up to board the first car but somehow we seemed to attract a herd of passengers with all sorts of luggage and prams. It was such a crowd that we knew boarding would be a nightmare and finding space for our bikes would be a competition. We gave up our usual spot and headed to the other end of the platform and took up position at the end of the empty and locked Metrolink Train when we realized that we were standing outside one of Metrolink’s Bike Cars. In the course of the weekend, we rode the Metrolink all three days, on the old cars that have room for two bikes per car, on the new cars that have room for three bikes per car, and on the Bike Car which has room for 18 bikes. The Bike Car is a retrofitted “old car” that consists of stripping the car of all seats (save the jump seats and the rear three) and finstalling two portable frames that create three spaces on each side allowing bikes to lean parallel to the wall. There are three bungies (short, medium, and long) for attaching the bike’s top tube to the rail along the wall. The emergency escape area (~4’x 3’) is roped off and once the bikes are secured, there is seating for about 8-10 people. When we first realized that we were standing outside one of the new Bike Cars, I used my iPhone to take some pictures but the light was bad so I used another camera with a flash. There is a sign on the side of the Bike Car, about 7’ off the ground, but it has little impact because of its location. We only noticed the Bike Car because we were standing next to it and looking in the window. From farther down the platform, there is little hope of noticing the sign and passengers standing on the platform awaiting an arriving train have little hope of jockeying to chase the Bike Car based on recognizing the sign as it goes by. As for the photographs, I was snapping away at the Bike Car, the sign, the interior through the windows, etc. when I realized there were two LA Sheriffs coming from the utility end of the platform, the off-limits area. I braced myself and, sure enough, they approached me. “Here, let me open the Bike Car for you!” one of them said. I was so stoked as they opened one of the two doors for me that I didn’t complain when I had to squeeze through the single side with a loaded bike. I wanted to ask them to open both doors so we could board easily but I was still stunned by their hospitality, especially because I had been prepared for a challenge of my late night photography in a train station. As it turns out, opening both doors wouldn’t haven’t made the boarding any easier. The open doorway has a pole in the middle, from top to bottom, and loaded bikes have to be “fed” through the opening, making it impossible to simply lift it up and climb the steps onto the train. The Sheriffs were kind enough to assist me and they “fed” our loaded bikes to me as I stood on the Bike Car. Overall, the Metrolink’s Bike Car is a great ride, the only downside being the pole in the doorway, an obstacle now just as it was an obstacle on the old cars. There are ramps that can be used to facilitate faster loading and unloading but with only one conductor per train, the demands on his/her time may not allow for the use of the portable ramps that fold in half lengthway and are stored against the inside wall by the doorway. Overall, the Bike Car is great, not just for its practical application, but for the loud message it sends, “Cyclists are valued guests on the Metrolink!” My only suggestion: get rid of the doorway pole. The Bike Car rates #1 in bike accommodations, ties for #3 in doorway access, and #3 in seating. 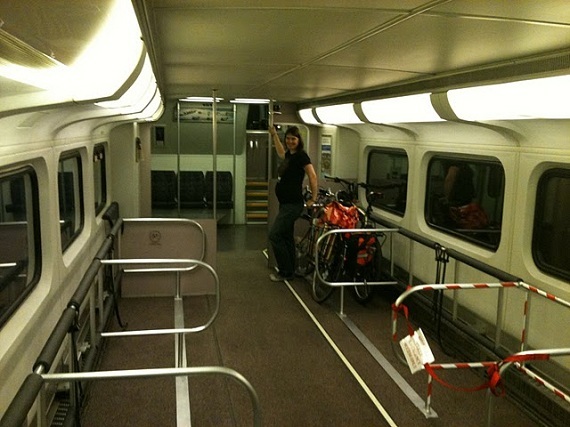 Since the rating is weighted, the Metrolink’s Bike Car wins for this cyclist! 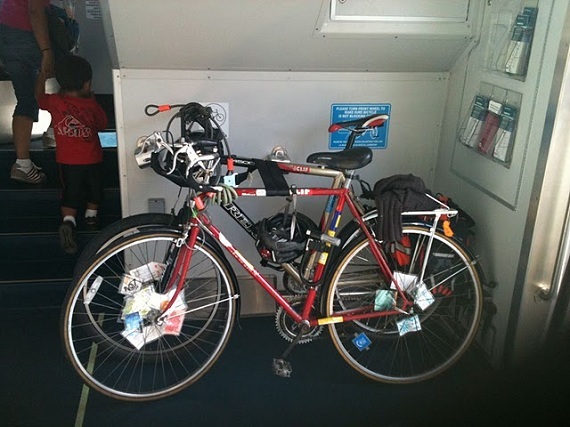 The old Metrolink Cars have room for two bikes per car, just inside the doorway (with the pole) and against the side wall. The space is also set up with a jumpseat and the competition for the space can get tough. As the bikes lean against the wall, the front wheels are strapped against the forward facing divider. I like the seating configuration on the old cars, there are areas set up with seating for four with seats facing each other, there are areas with booth seating and tables, and the traditional forward facing rows of seating have plenty of legroom. The only challenge with the old cars for cyclists is having to run from car to car while on the platform, looking for unoccupied bike space. That being said, the old cars rate #3 in bike accommodations, tie for #3 in doorway access, and are #1 in seating. Given my choice, I will sit in the old cars but lock the bikes in the Bike Car. The new Metrolink Cars have room for three bikes per car, just inside the doorway (without a pole!) and against the back of the car. They also have straps to attach the wheels to the wall and, in addition, have a ratcheting seat belt that can be used to secure the bike frames to the wall. Both the old and new cars have small 6” square blue signs along the doors to indicate which end of the car has the bike space and it’s fairly easy to spot them as the train pulls into the station. This isn’t as important at Union Station where the train is waiting on the passengers but when the passengers are waiting on an arriving train, there’s pressure to find the empty car and then to board quickly. Metrolink responded to this criticism by explaining that the Guardian Fleet cars have a seating configuration that enhances the collision energy management (CEM) technology that the manufacturer, Hyandai Rotem, incorporated into the car structure. Overall, the new Metrolink passenger cars rate #2 in bike accommodations, they’re #1 in doorway access, and #2 in seating. Given my choice, I’ll always take the Bike Car but if it’s between the old and new passenger cars, I’ll park the bikes in the new car and sit in the old car. Over the last several #BikeTrain adventures, the Metrolink’s service has been consistently positive and the conductors have been very professional with only one exception. On one of the Union Station boardings, we arrived close to departure only to find that there were two bikes in each car, making it tough for the two of us and our loaded bikes. We continued down the train and at the end, found an empty Guardian Fleet car. We tried to board but the doors were closed and the conductor directed us to the front of the train. I explained that the cars all had bikes and that we didn’t fit. With great reluctance on his part and a bit of an insist on my part, he allowed us to board the empty car, one where he had already set up his camp. Other than that, the Conductors have always been efficient, professional, and courteous. They are easily identifiable in their uniforms and they communicate clearly and on their own initiative, a rare sign of customer service commitment. If I were to make a recommendation, it would be to also put the Train Engineers in uniform, raising them to the same level of professionalism that we expect from the other Metrolink employees. At the end of our most recent #BikeTrain adventure, we were among the last to disembark and as we stood on the platform, we saw a guy dressed in very casual street clothes exit the engine and walk through the empty train, apparently the Metrolink Engineer. I wonder if such a casually attired person would be able to communicate authority in an emergency. A minor point but worthy of note. The Metrolink’s new CEO, John E. Fenton, is not really new any more but he is certainly following through on his commitment to serve as a change agent focused on enhancing the Metrolink’s guest experience. This has resulted in the Metrolink positioning itself as more than a simple commuter train, branding itself as a great adventure for cyclists, racetrack fans, urban explorers, and people who love to travel in hassle-free comfort. The Metrolink’s $10 Weekend Pass has prompted us to take lots of weekend #BikeTrain adventures that start at Union Station. For so long LA’s Union Station was a monument to contrasts, on the one hand an architectural legacy loaded with history, on the other hand a sad shadow of its former self, most notable for the stench of urine that wafted from the restrooms. I’m pleased to report that under the Metro’s leadership, Union Station has been now been revitalized. Arriving guests are still greeted by a strong aroma, but now it’s the smell of baking bread! The Metro deserves credit for the work it is doing inside Union Station. One can only hope that some of the Metrolink’s “Bike Love” will rub off and Metro will tackle the abysmal bike parking at Union Station, including the toaster rack out front and the “Marquis de Sade” racks in the courtyard. Thanks for the article… I use Metrolink fairly regularly, not as a daily commuter, but to visit family in Orange County. 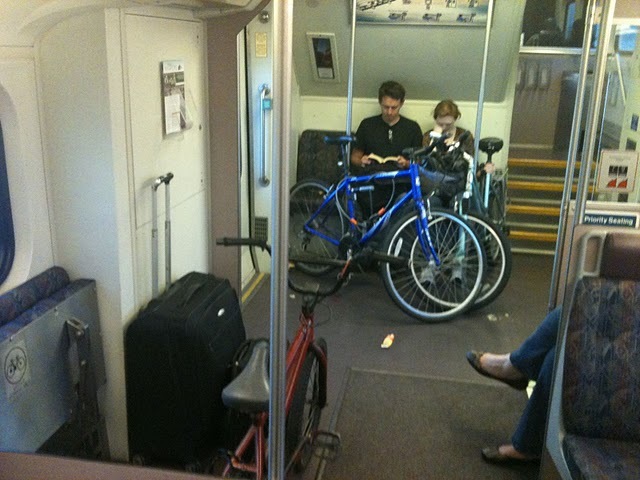 As you’ve alluded to, on the actual train, Metrolink is very good – plenty of space, clearly for bikes (though some folks put luggage there and one has to get them to move it.) Kudos to Metrolink for this! Kudos on the new high-capacity bike cars, too. I think that, similar to what you’ve mentioned at Union Station, what is somewhat lacking is good bike parking at stations. Commuters in European cities, the SF Bay Area, etc. have a good tradition of biking a few miles to a somewhat suburban station, locking the bike securely, and taking the train in to the urban core. I imagine Metrolink would like to have their locomotive engineers wear uniforms, too–as done in many foreign countries–but I expect the Brotherhood of Locomotive Engineers and Trainmen would resist such a change in work rules, especially since it would abandon a long-standing tradition in American railroading that engine service employees aren’t required to wear uniforms, dating from the steam days when their clothing would rapidly become covered in soot, grease, and oil from the machinery, making uniforms irrelevant. To be fair, the engineers do wear identification badges, sometimes with a distinctive neck lanyard, and they don’t ordinarily interact with passengers at all–in most emergency situations, their duty is to remain on the engine or in the control cab. L.A. Union Station has only recently come under the ownership of LA Metro. It lagged for a long time under the ownership of Catellus, a descendant of the Southern Pacific and Santa Fe Railroads before they realized that there was a potential for retail given the increasing numbers of passers-by going to LA Metro Rail, SCRRA/Metrolink, Amtrak Surfliners, Amtrak LD and the various bus operations including the successful LAX FlyAway. No, it is not the “LAUPT” of the 1930’s, but I am guessing the building is more used and more respected today than it ever was. She is certainly in far better shape now than before SCRRA/Metrolink stared up in 1992, and hopefully the bathrooms are next on the renovation list. The “old” cars were built by Bombardier or UTDC before Bombardier bought them out, in Thunder Bay, Ontario. (They are based on a design created for Toronto’s GO Transit by UTDC predecessor-company Hawker Siddley Canada). The old, Bombardier cars have a set of doors without a pole at the bathroom end of the lower level. This is the door used on the trains for wheelchairs, and while there are ramps as you noted, they really only work in tandem with the raised mini-platforms one sees in the place where the cab cars stop (are “spotted”). The new cars are built by Hyundai Rotem in South Korea, with final assembly in-house by SCRRA/Metrolink in Colton. They are dubbed “Guardian” but this is a bit of Orwellian claptrap designed to ease the fears of riders in light of the Chatsworth collision. (Notice that the old “Smashing Arrows” logo has disappeared from trains?) The Rotem cars do have better crash-absorbtion technologies, as well as the cocoon-like seating that so many are complaining about. Safer? Maybe. Will they be my “Guardian” in a crash? Don’t really want to find out, thanks! Thanks for the intel. Do any of the cars have room for cargo bikes or bikes with trailers, say about 8 or 9 ft in length? It’d be great to be able to take those on. Thanks!